Our private dinner and lunch cruises for 2-8 passengers offers catering from the four-diamond Hyatt Regency Hotel. Our 2-8 passenger boats provide an intimate setting to celebrate your special occasion. 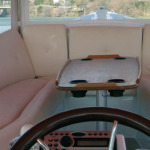 Driving our electric Duffy boats is as easy as driving a golf cart. Groups larger than 7 are encouraged to try our larger Myacht vessel. *One-hour boat rentals available before 5:00 pm. Please call for details.